From the U.S. Army’s Center of Military History’s Army Museum Enterprise you can find the details of the Reed Museum, also known as the 2d Regiment of Dragoons Heritage Center. 23 May 2016, the 180th birthday of the Regiment, saw the release of the Reed Museum’s first Museum Gallery Guide. This gallery guide is a 121 page booklet that tells the story of the Regiment through text and artifacts along with providing Soldiers of the Regiment a unique history study guide to better prepare them for boards and other developmental events. For a free copy ask the museum staff during your visit to the museum. The Reed museum exhibits artifacts and interprets the historic contributions of the 2d Cavalry Regiment from its formation in 1836 to the present day. Gallery exhibits take the visitor through the storyline, which emphasizes the traditions, service, and sacrifice of the Regiment and the important role the unit has played in the evolution of the U.S. Army and American military history. The museum is located on Rose Barracks in BLDG 342, which was originally constructed as a horse stable in the 1930’s by the German Army. Our Mission Statement – To collect, preserve, exhibit, and interpret historically significant objects related to the history of the 2d Regiment of Dragoons from 1836- to the Present. The museum will provide educational programs and services for a variety of military and civilian audiences, as well as enhance morale and esprit de corps for members of the 2d Cavalry Regiment. The Reed Museum traces its connection to the Regiment to the late 1950’s when Merrill Barracks, Nurnberg, Germany became the Regimental headquarters. Initially called the “Trophy Room”, because of its numerous sports trophies along with historic artifacts, the museum then primarily functioned as a Regimental command conference room and location for ceremonies and special events. In 1980, the Trophy Room was renamed and dedicated to the 31st Colonel of the Regiment, Col. Charles H. Reed, in honor of over forty years of service to the Regiment and the 2d Cavalry Association. In 2010, the Reed Museum was reestablished on Rose Barracks, Vilseck, Germany; occupying an unused building that originally functioned as a 1930s-era horse stable. On 23 May 2013, the museum reopened with a new gallery, which currently provides Soldiers, families, and friends a chronological history of the Regiment from 1836 to the present. The Reed Museum is named in honor of the 31st Colonel of the Regiment, Col. Charles H. Reed in honor of his over forty years of service to the Regiment and the 2d Cavalry Association. Reed served in the Regiment several times through his career, most prominently as its World War II commander where he successfully trained and led the Regiment (then known as the 2d Cavalry Group) through five campaigns in Europe with Patton’s 3rd Army. After the war he continued to command the Regiment through its early constabulary period in Germany. 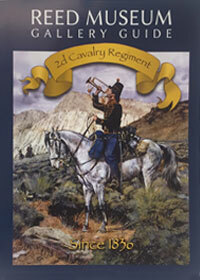 After his retirement in 1949, Reed served for many years as the President of the 2d Cavalry Association. The museum was dedicated in his honor after his death in 1980. The museum is open Monday – Friday 0900-1700 or by appointment. The museum is closed on all Federal Holidays. Access to the installation requires a Military ID Card, for all non-Military ID card holders pre-visit coordination is required and is based on staff availability. Please do not send unsolicited donations to the museum. For information on how to doate to the Reed Museum, please contact the museum staff.